Even the Volkswagen owner who has no intention of working on his or her own car will find that reading and owning this manual will make it possible to discuss repairs more intelligently with the professional technician. Keeping this manual handy in the car ensures quick access to official factory information. 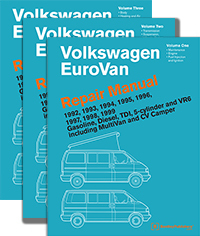 For additional technical content for T4 platform Volkswagen EuroVan models, visit our online technical library by clicking below.